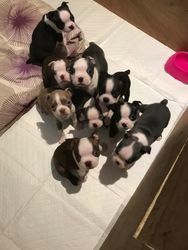 Beautiful 8 weeks old Boston Terrier puppies. All raised in our home, very alert happy puppies, used to other pets and children. 5 girls and 2 boys. Great bloodlines. Puppies are vet checked, micro chipped and wormed. For more info please contact me.